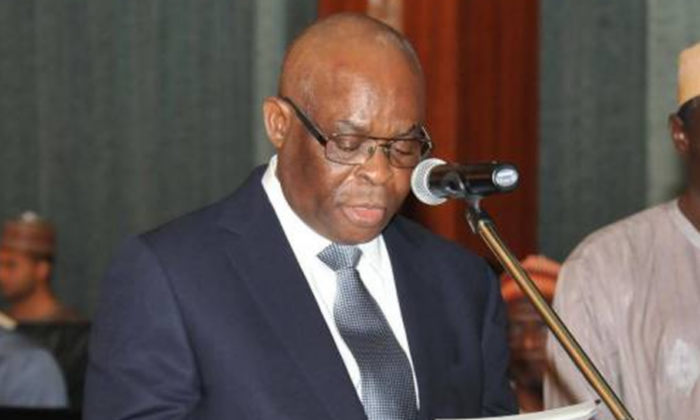 The Court of Appeal, Abuja Division, on Monday declined the request by the Chief Justice of Nigeria, Justice Walter Onnoghen, to make an order stopping the Code of Conduct Tribunal from proceeding with his trial. The Code of Conduct Tribunal had on January 14 fixed January 22 for hearing in the six counts of false assets declaration filed by the Code of Conduct Bureau against Justice Onnoghen. The Attorney General of the Federation and Minister of Justice, Abubakar Malami (SAN), had also filed a motion asking for an order directing Onnoghen to step down as the CJN pending the conclusion of his planned trial before the CCT. Two non-govermental organisations – Centre for Justice and Peace Initiative; and International Association of Students – had approached the Federal High Court in Abuja, praying for orders quashing the charges against the CJN. In response to the NGOs, Justice Evelyn Maha of the Federal High Court, Abuja had last week issued two separate orders directing that status quo should be maintained in Justice Onnoghen’s case before the CCT. In furtherance of the steps to stop the CJN’s proposed arraignment before the CCT, his lawyers, led by Chief Adegnoyega Awomolo (SAN), went before the Court of Appeal on Monday wanting to obtain another restraining order against the CCT. Awomolo told a three-man Court of Appeal panel led by Justice Abdu Aboki, that the restraining order was necessary to preserve the subject matter of the case at the CCT. But Federal Government’s counsel, Emmanuel Omonuwa, said he was only served with the court process by Justice Onnoghen’s legal team on Monday morning and he needed at least three days to reply. After a short deliberation among themselves, the three Justices of the appeal court declined granting Awomolo’s prayer to halt the CCT proceedings against the CJN. “We are of the view that no form of order shall be made at his stage pending hearing of motion on notice adjourned till January 24,” the panel ruled. However, the National Industrial Court in Abuja reaffirmed its last week interim order stopping the CCT proceedings against the CJN. The industrial court gave the restraining order in a suit filed by a lawyer, Peter Abang. On Monday, Justice Sanusi Kado of the NIC reinforced the restraining order following an ex parte application moved by Abang’s counsel, James Igwe (SAN), who said he was having difficulty serving the court papers personally on CCT Chairman, Danladi Umar. The judge directed that all the parties in the suit before him should not take any step that could destroy the substance of the case pending the hearing and determination of the claimant’s motion for interlocutory injunction. Joined as respondents in the suit before Justice Kado are CCT Chairman, Attorney General of the Federation; Inspector-General of Police; Senate President; the Federal Judicial Service Commission; National Judicial Council and the Code of Conduct Bureau. At the Monday proceedings before the NIC, only the NJC was represented by its lawyer, Dr Garba Tetengi (SAN). Meanwhile, there are indications that the Justice Onnoghen may again not appear before the CCT on the next adjourned date. One of the lawyers on the CJN’s defence team confided in our correspondent that the preliminary objection filed against the charges must be dispensed with before any step could be taken in the matter. “The CJN will not appear before the court. We have filed a preliminary objection to the charges. The status must be determined and that will determine the next step on the matter,” the counsel said. Also on Monday, the National Chairman of the Action Peoples Party, Ikenga Ugochinyere, told journalists in Abuja that his party had obtained a fresh order from the Federal High Court, restraining the Federal Government from removing Justice Onnoghen as the CJN. According to the copies of the interim order made available to journalists by Ugochinyere, the order was made against President Muhammadu Buhari, the Attorney General of the Federation, Onnoghen, Justice Ibrahim Tanko, the Code of Conduct Bureau and the Chairman of the Code of Conduct Tribunal.